Just consult the comprehensive application guide which makes it clear exactly which version fits your car. Supra Roof Bars are available in a variety of kits to suit most vehicles with 2 different types of kit available. Use the application guide to determine whether your vehicle requires a Supra Multi or Supra Specific kit, and take note of the appropriate kit number. When looking for your vehicle in the application guide make sure to choose the correct roof body style from the table. Once you have determined which kit you require, choose the appropriate kit below or enter the kit number in the search bar. When using Supra Multi kits some 3 door cars will also require a 3 door adapter but this will be made clear in the application guide. 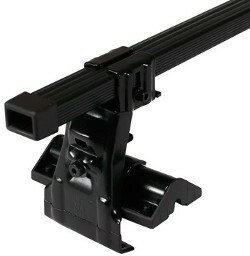 Extension kit to allow fitting of Mont Blanc Supra Multi roof bar kits to compatible 3 door vehicles. This is the extension kit only and you MUST refer to the fitting guide for the appropriate roof bars kit and to check compatibility. Straightforward steel Roof Bar kit with versions to fit most cars. The Mont Blanc Supra Roof Bar Kits come complete with all required mountings and most kits come fully assembled, making it easier to work out what you need for your vehicle, and simpler to install when you get it.